Editor's note: In 1899, six years before the Forest Service was born, Gifford Pinchot wrote an article for National Geographic titled, "The Relation of Forests and Forest Fires." He was then the head of the federal government's Division of Forestry, which would later become the Forest Service, with Pinchot again at the helm. Excerpts from Pinchot's article are reprinted below, and reflect a remarkably clear understanding of the ecological role fire was playing in forests then under his jurisdiction. Even so, he could not bring himself to side with fire. Thus, in the article's concluding paragraph, he wrote, "I hasten to add that these facts do not imply any desirability in the fires which are now devastating the West." Some historians believe this remark may have had something to do with the fact arson was widespread at the time, a western reaction to creation of federal reserves. Read John Leiberg's comments in "Could What Happened in 1910 Happen Again," page 37. In any event, Pinchot's explanation of fire is as instructive as it was ninety-five years ago, and should help readers understand the relationship between fire and other natural forces at work in forest ecosystems. Perhaps the most remarkable of the regulative effects of forest fires relates to the composition of the forest ? the kinds of trees of which it is composed and the proportion of each. This effect depends upon the action of fire in combination with the various qualities of resistance which trees possess. These qualities are of two chief kinds; one adapted to secure the safety of the individual tree directly through its own powers of defense, the other to assure the continuance of the species with little regard for the single tree. A somewhat less obvious, although not a less interesting, instance of distribution controlled by fire is that of the red [Douglas] fir in those portions of Washington [and presumably Oregon also] where it reaches its best dimensions and greatest commercial importance. Here the young seedlings are found in remarkable abundance on unshaded spots wherever the vegetable covering of the mineral soil has been burned away ... Continuous stretches of miles without a break were covered with a uniform growth of Douglas fir [red fir] from two to three feet in diameter, interspersed with numerous rotting stumps of much larger trees bearing the marks of fire. The young firs were entirely unscarred, but charcoal was found at the roots of some specimens which had been thrown by the wind ... I did not see a single young seedling of Douglas-fir [red fir] under the forest cover, nor a single opening made by fire which did not contain them. 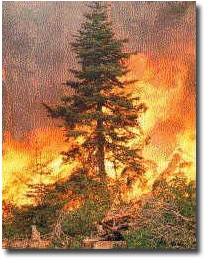 In a word, the distribution of red fir in western Washington, where it is by all odds the most valuable commercial tree, is governed, first of all, so far as we know at the present time, by fire. Had fires been kept out of these forests in the last thousand years the fir which gives them their distinctive character would not be in existence, but would be replaced in all probability by the hemlock, which fills even the densest of the Puget Sound forests with its innumerable seedlings. I hasten to add that these facts do not imply any desirability in the fires which are now devastating the West.